GATEWAY TO THE PROMISED LAND! The beautiful Canadian Pacific Railway Station in Winnipeg, MB has extraordinary significance for the David J. Fast family who arrived in Canada 75 years ago as Mennonite immigrants from the Ukraine. On February 27, 1930 at 6:30am, an event transpired in this building which changed the course of history for the entire family and all their descendants. A young couple, David and Agatha Fast, thirty-one and twenty-seven years of age, with their four children in tow, ages six, five, three and one, set foot in this building, looking like forlorn and lost immigrants, which in fact, they were. The magnificent CPR Station, then 25 years old, was to become their gateway into the Promised Land and into a new freedom. What an emotional introduction to the New World it must have been as they walked through the impressively polished brass doors from the railway platform in the cold outside and entered the Rotunda with its beautiful chandeliers, there to be greeted warmly by relatives who had arrived in Canada a few years earlier! The story leading up to their arrival at this station in the dead of the winter is filled with pathos and suspense. The Fast family came to Canada from the Ukraine where their ancestors had lived since the turn of the 19th century. There they had built a secure and productive community for themselves. In 1917 the 128 years of relative bliss turned into an unbelievable nightmare almost overnight. The Russian revolution had begun, thrusting the family into a 13 year period filled with immense uncertainty, fear, suffering, untold hardships, hunger, despair and dashed hopes. The frequent raids of the Makhno bandits and other lawless hordes who ravished the countryside, including the Mennonite villages in the Ukraine, during the years of anarchy in the early 1920’s are legendary. David and Agatha were not spared the horror but survived those years to start over again in Canada. Many of their family and friends did not. The Fast family escape from Russia was fraught with anxiety and suspense. They abandoned their farming village, Memrik, in the fall of 1929 as their lives were spiraling down hill and the prospects of things ever improving slowly faded away. After illegally selling what few possessions they still claimed as their own, the family began its dangerous trek from Memrik to Moscow where they joined thousands of others seeking to leave the country. For two agonizingly long months they encamped in the cold Moscow suburbs waiting for clearance to leave. 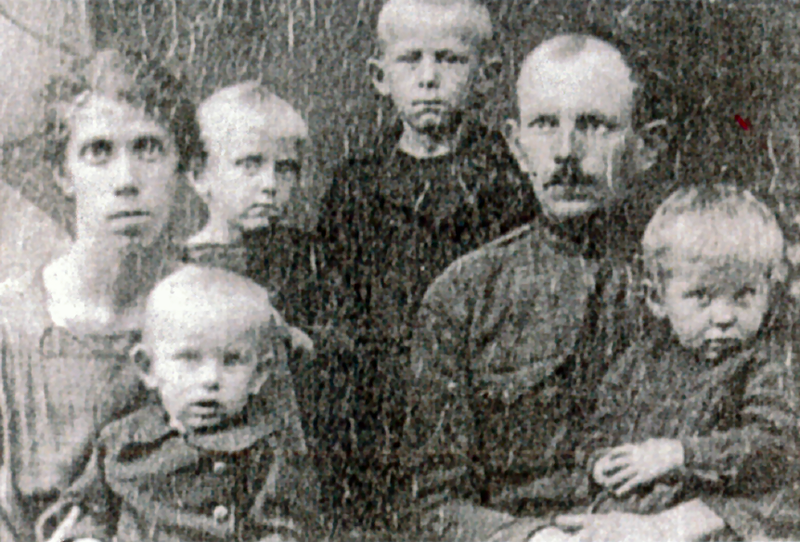 While waiting, walking the streets of Moscow and living in the city’s empty summer villas wherever they could, one family after another was rounded up, often at night, seemingly at random, and shipped back to their home community or torn asunder as healthy males were transported to Siberia, there to be confined to working in the brutal mines. Many met their death. Repeatedly the hopes of the Fast family to emigrate to Canada, threatened to come apart at the seams. The details of that part of the story cannot be told here. As David and Agatha saw it, by the hand of God their destiny ultimately was to be counted among the lucky ones who made it out of Russia when all the doors around them were closing rapidly. They were among the 1st group granted permission to leave the country by the Russian authorities. Getting out of Russia in to Germany was one thing. Getting into Canada was another matter. The Canadian government had essentially closed the door to additional Mennonite immigrants by 1929, in part because of adverse public opinion and worsening economic conditions. The stock market had crashed in the U.S. The depression was looming. When Canada finally agreed to allow additional immigrants, partly as a result of the advocacy of the CPR, it set up stringent medical standards which many could not meet, including upon first examination, the Fast family. The steamy hot Chaco of Paraguay seemed to be the last viable option available— not a pleasant prospect even for those who had nothing to lose. In the end, by good fortune and the hand of God, the Fast family was cleared for admission to Canada. After what seemed an agonizingly long stay in Germany which included a sojourn in two immigration camps, the remainder of the journey to their new home finally could commence. A trip across the North Sea to Grimsby, England followed. From there a train took them to Liverpool, where they finally embarked on February 14, 1930, on the ship, Montrose, to begin their nine day journey across the ocean. The Montrose docked in St. John, New Brunswick on February 23, 1930. There the weary and by now exhausted family boarded the CPR train for western Canada! The family arrived in Winnipeg four days later, on February 27th, more than four months after leaving their home in Memrick, ready to begin rebuilding their life and a new home on the prairies of Canada. Another issue for the family in coming to Canada had to do with how to finance the entire journey. Fortunately the CPR had agreed to supply credit, as well as to draw on its land resources at home and its contacts abroad in arranging for the ship and train transportation to help bring Mennonite immigrants to Canada. Further, the company’s patience during the dry, dusty thirties when it was at times impossible to keep up with debt repayment obligations because of the poor crops, was helpful to the Fast family, and others, in getting through those initial difficult years of life. The very significant role the CPR played in assisting the immigration of many Mennonites from Russia during the difficult decade of the 1920’s was exemplary and is gratefully acknowledged. David and Agatha remained forever grateful to Canada for accepting them into this great land. They at times referred to their adoptive country as Kanaan instead of Kanada! It was the promise land. The family never wavered in their gratitude to God, to country and indeed the CPR, for making it possible to come to Canada when their future seemed the bleakest. When a train coming from the east enters Winnipeg on its way to the CPR Station, the Red River must be crossed. For the Fast family, crossing the Red River was as though the Red Sea itself had been crossed! So it was that upon entering the CPR station on that momentous cold day on February 27, 1930, and being welcomed inside, in part, by its beauty and warmth, the family must have sensed they were now safely on the other side! It was a hallowed moment in their lives. Today the CPR station is a place extraordinaire also for us, their descendants. It will forever stand as the historic gateway into the Promised Land for the Fast clan. Story submitted by Victor Fast, on behalf of the Fast family. I arrived on Saturday August 7th, 1965 in Winnipeg’s CPR station, that was 40 years ago. I was a very young man, just turned 19. I could not speak English at that time. I was supposed to report to the immigration office in the C.P.R. station, but it was closed for the weekend. You can imagine my feelings, not sure what to do and where to go. On Main street I found a person who spoke some German, and advised me to go to the police station. In the police station a German speaking employee helped. So I was sent to the YMCA on Vaughan street, the best and cheapest lodging I could get until Monday, when the immigration office opened. On Monday, I returned to the magnificent C.P.R building. This C.P.R. building was my Ellis Island, the feelings of hope and fears I had. In contrast to Ellis Island, no fears. I felt just hope and some worries. I will always be very thankful on this Monday from the immigration office I received an address for lodging and a job. The CPR station had the appearance of functional elegance with an unforgettable old time smell to it. The CPR building was for me the entrance to my new home and country. I was sent to English classes and where I received my introduction to Canada. It was a great pleasure of experiencing the old feeling of entering my new home. I will always be grateful to Canada. Story submitted by Manfred Jakob, of Waterloo Ontario.